Do you need information on how to travel around Paris, how to use public transportation, or choosing the right bus or boat tours? You’ve come to the right place. Welcome to your go-to guide to getting around Paris. The Paris metro is ranked as one of the best transportation systems in the world. There are approximately 300 stations that will get you within a few blocks of your destination. The metro operates from 5:00 a.m. to 12:30 a.m. daily. Tickets are valid for the time you are in the metro, once you leave then you will have to purchase a new ticket to access the metro again, unless you buy a day pass. Tickets can be purchased at a ticket booth in the station in a quantity of one at a time, ten, 1-day, 2-day, 3-day, 5-day, Le Paris Viste tickets for tourists. If your stay is longer you can also purchase a monthly pass called the Carte Orange. When you use your tickets stick it in the turn style slot and then be sure to take it when it is ejected and keep it with you during your trip. Sometimes fare checkers will be on trains checking for tickets and if you do not have your stub will be fined. You can obtain a metro map at the stations and they are also posted throughout. Many guidebooks have them however sometimes they are small you might need a magnifying glass to see them. Transport maps are color coded which will help to navigate you through the system, therefore all you have to do is find the station you want to go to and find the line that goes there and see what the final destination for that train is. In the station, follow the signs for the destination and when the train comes get on and pay attention to where your stop is. Follow this link for a map to the Paris Metro so you can familiarize yourself with the system. Overall the Paris subway system is relatively easy to navigate especially if you come armed with the right information. 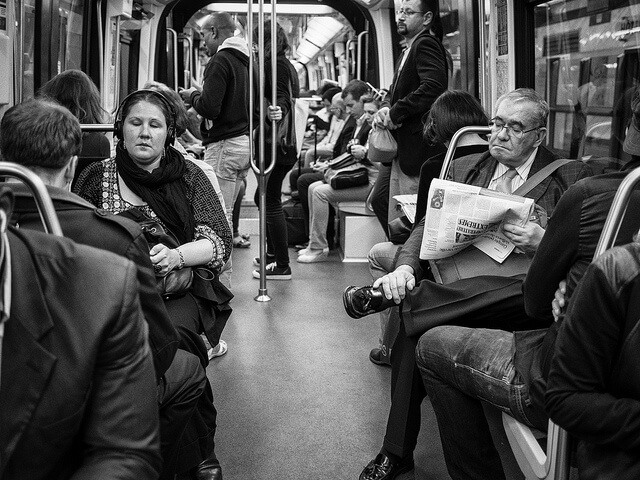 Follow these tips to help you navigate public transport like a pro. Obtain a metro map: These are free of charge and available in any metro information booth or you can download one. Map it via Mobile Device: There are great free apps available for your smartphone, IPhone or tablet like this one to find a great map for you mobile device. Avoid riding the metro or RER at rush hour: (8:00-10:00 a.m. and 5:00-8:00 p.m.) During these times, opt to walk or take the bus or stop at a café to wait for the peak travel time to die down. Metro lines 6 and 2: These line operate above ground on most of their route which can offer some impressive views of the city. Line 6 offers splendid views of the Eiffel Tower and line a spectacular view of Sacre Coeur. When purchasing tickets from ticket machine in a Metro or RER station, in some stations only debit cards and coins are accepted. Also know that at metro stations with booths marked ‘Information’, tickets are sold exclusively at self-service machines and the staff at the information desks are there only to answer questions. Word to the Wise: Do not purchase tickets from vendors on the street or hovering around station entrances to stations, as these tickets may be counterfeit. The RER is a suburban line that goes outside the city with several stops in central Paris. Your metro ticket can be used on the RER however only in the central part of the city. If you are planning an trip outside of the city, plan on obtaining a separate RER ticket. There are four lines on the RER and most travelers to Paris use Line C to transport to Orly Airport, Line B to transport to Charles De Gaulle or Line A to go to Disneyland. You can use a helpful Paris RER map to guide you on your journey. The bus system is a trustworthy way to traverse about the city and can be a good way to familiarize you with the city. Metro tickets are universal and can be used on the buses and can also be bought on the bus as well as at metro stations. When you board the bus, there is a machine that stamps your ticket and like the metro hang on to it as proof of payment. To transfer from one line to another, you need another ticket. There are bus maps available at the metro stations as well as posted in bus shelters. The majority of buses run from 6:30am to 8:30 pm, however few buses run until 12:30am. Paris bus tours can be an excellent way to get an overview of the city’s top tourist attractions when you’re visiting for the first time. Bus tours can also be ideal for elderly visitors, parents with young children, visitors with disabilities or if you are looking for a guided tour. Paris’ top bus tours are hop-on, hop-off which shuttle passengers several times a day to many or all of the city’s key sites. There are approximately 15,000 Taxis in Paris and finding one is typically not a problem. Taxi stands are located all over the city and you can also hail them in the street. Taxis are relatively inexpensive and the easiest way to get home after a day or night of walking around. People are encouraged if they are driving to Paris to leave their cars in the suburbs and use public transportation. You will not need a car in the city and if you do, driving can be a challenge. Parking can be a headache unless you are willing to pay to park in an underground lot near your lodging. Otherwise if you want to park on the street you will need a Paris Carte since parking meters do not accept coins.Car rentals typically require a three day minimum, therefore it is smart to save your day trips outside Paris for one long stretch with possible overnights so you can avoid the hassle of navigating the streets and parking.If you still want to rent a car in Paris, companies including Hertz and Avis rent cars from several pickup points in and around Paris and at the main airports, Charles de Gaulle and Orly. Paris operates the Vélib bicycle rental program that utilizes unisex bikes which you can pick up at stations or dedicated service points located around the city. The great thing about this program is you can pick up a bike at any Vélib’ station and return it at a different location. You will need a bank card that is compatible with their transaction (VISA, MasterCard etc.). A one day ticket costs about 1€ or a seven day ticket will costs 5€ and entitles you to an unlimited number of journeys throughout the entire period of your rental. The first 30 minutes of each trip is free of charge. You can view more information by visiting the Velib site. Launched in 2007, Paris’ city bike rental consists of approximately 20,000 bikes and about 1,800 rental stations around the city. It has become immensely popular with both locals and tourists, and has helped turned the city into a bike friendly place. If you are interested in a bike tour, City Discovery offers a daytime bike tour of Paris as well as a nighttime tour. Taking a tour of Paris by boat is an unparalleled experience. Tours offer an chance to view the spectacular skyline of Paris while you serenely drift down the Seine River or Paris canals. A boat tour allows you the opportunity to be intrigued by the city’s most mythical spots, enjoy a romantic dinner, or simply relax and enjoy the fresh air and scenic setting. The best time to take a boat tour is generally May through mid-September, when the temperatures are pleasant and warmer.